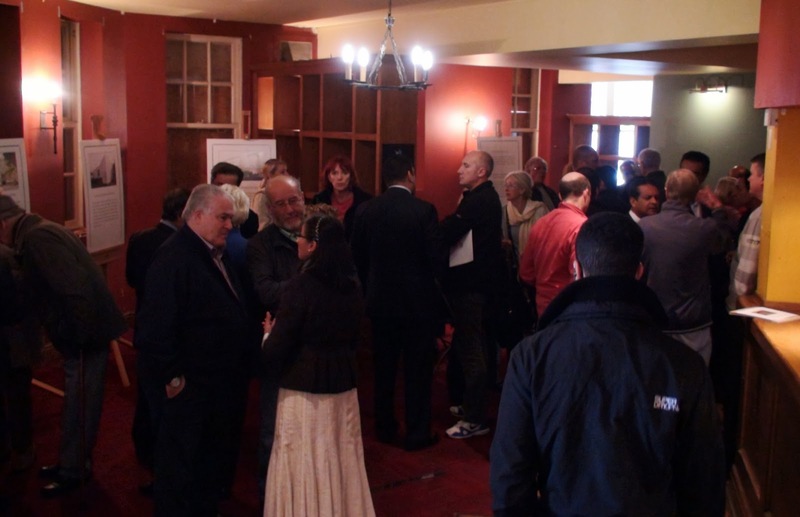 Like many Worcester Parkers, I went over to the Old Worcester Park Tavern on Saturday to see the Ismaili presentation for their proposed community centre. I should say now that this wasn’t my first contact with this Ismaili community. The previous week I, and several other local supposedly ‘influential’ people received invitations to meet with their representatives at the home of one of their local members. I managed to visit them last Friday for a cup of tea and a chat. They were extremely charming and hospitable and wanted to explain in greater detail than was possible at this weekend’s event what the Ismaili community was all about, talk about their current centres in London and the good works they did around the world. They had done their homework; they knew all about the Green Lane application, and had been at the latest hearing, although they did explain that the Green Lane application was a completely different group and nothing to do with them. I admit I did come away feeling more reassured about their proposal, which was to be expected. 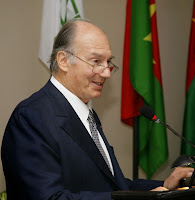 On Saturday, even though I had an idea of what to expect, I was still struck, like I think many people were, by the friendly hospitality shown by the Ismaili volunteers to everyone who turned up. They were keen to demonstrate what the Ismaili community is all about and what makes them a unique group and I think they made a positive impact here. Many readers will be aware that a number of people had planned to turn up at 2pm for a major protest. Some police arrived just before 2pm and were keeping an eye out while wandering around the presentation space. The room was indeed at its most packed at 2pm (pictured above) but there was no sign of any organised protest though. Perhaps the police presence put them off or perhaps, as one volunteer suggested, they were taken aback by being offered a hot drink and some biscuits by the people they had come to protest against. First I should point out that the number of visitors I originally published has been revised upwards. I was originally given these numbers by The JTS Partnership LLP, the company employed to run their campaign. However at the consultation event there were information boards around including one which showed projected visitor numbers as being around 70-80 on most evenings with up to 135 on Friday evenings. There could be a number of reasons why the numbers I was given the first time were not the same as the ones being publicised now. I am not going to assume it is a particularly sinister reason, nor will I assume it is completely benign. I am keeping an open mind. I have been told more than once that this will not be a Mosque. It is to be known only as an Ismaili Community Centre. However I was told that there will be a large room set aside for regular religious services. These would include communal prayer, readings, lessons et cetera – very similar I expect to what many of us sometimes experience on a Sunday morning. I was told that these are quite different to the five daily prayers that a Mosque would host, and also that to be a Mosque it would require other things including a minaret. Mind you regardless of what it is called, I don’t have any problems with people praying, either all together or separately. The only problem with a large number of people turning up to attend a specifically timed function, be it prayers, choir practice or a used car auction is Worcester Park’s age old traffic and parking one. It is very possible that more people were in the building at any one time when it was a pub, than will be attending one of the Ismaili events. And there are 54 car parking spaces which I would think would be enough for 135 people, especially when you consider many people will be husbands and wives (plus others) in a single car and some will arrive by train etc. However while I was reassured that they would not all turn up and leave at the same time, I can’t help thinking it would be within a much shorter time span that those turning up to hear the “Rough Diamonds” play a few sets at the Tavern, especially when many of those drinking would have specifically chosen not to turn up by car. I am not an expert on traffic and parking but I am open to the idea that this may cause some extra problems in the immediate vicinity at certain times of the week. I also find myself wondering why they have stated a rough maximum of 135 people when their recent proposal in Hook, which was turned down by Kingston council, was expecting a daily attendance of 200 people. Being that this would be representing the same large overall area, where have the other 65 people gone? I realise that only a lowish percentage of all the area’s Ismailis would be turning up regularly, but it is stated in this report that there are 600 members around Kingston and if this centre was serving all of Kingston plus parts of Sutton, Surrey and other areas, I wonder if 135 people is an accurate projection. Conflicting figures are never a good sign. The whole speech can be found here and I would say is well worth a look. I have read comments from other members of the Muslim community denouncing Ismailis as not 'real Muslims'. See here for a sample. Although I hope and assume it is just a minority expressing such opinions. Readers will note it has taken me a few days to formulate this particular post. This is a complex issue and not one where I would want to be jumping to a quick conclusion based on scant evidence. I admit if we are not going to see the building turn back into a pub, I would probably rather see the proposed hotel development go ahead which I think would do immense good for the local economy. Incidentally I was told that the building is still owned by Shiraz and Nameem Bhogani who are Ismailis but have not actually sold it to the Ismaili community. However I think the numbers of people and also timings of visits need to be made much clearer and the conflicting numbers all resolved independently before any real conclusions can be drawn about this proposal. While the Green Lane proposal was clearly just a bad planning proposal (an opinion now endorsed twice by Sutton’s planners and the Development Control Committee), this one could possibly be a bad planning proposal but it is not as clear cut. More independent evidence is clearly needed. Many have said that the building should continue to serve the whole community. One of the first things I suggested at my first meeting was to find a way to involve the whole community in the centre. Perhaps the hotel could still go ahead, but include a smaller meeting area dedicated for Ismailis plus a community centre as well. In a five or six story hotel building taking up the land available (with underground parking for 150 cars), I’m sure that would be a very feasible arrangement that would hopefully be better received by the Worcester Park community. – Just a thought.